So Long, Snowman. 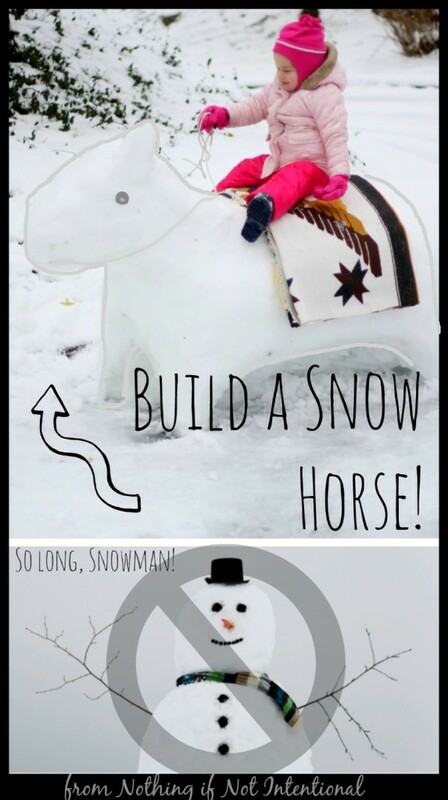 Make a Snow Horse Instead! When I was little, my dad didn’t help me build a snowman. 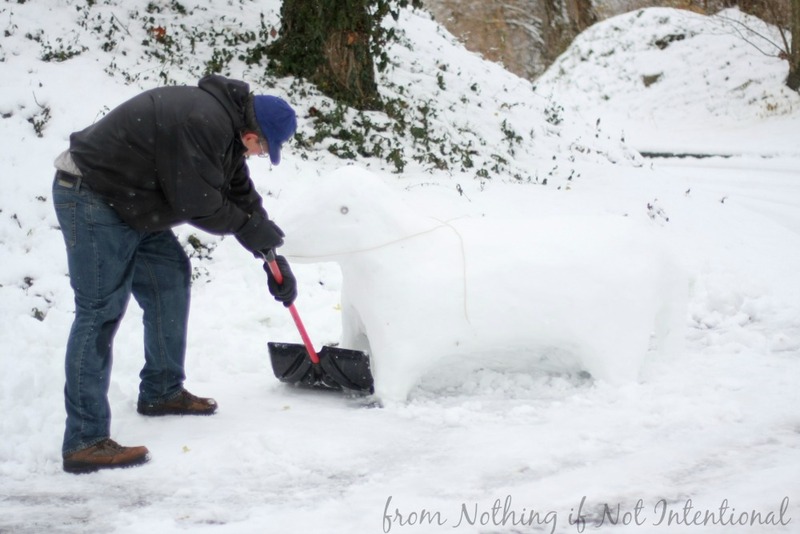 He built snow horses. 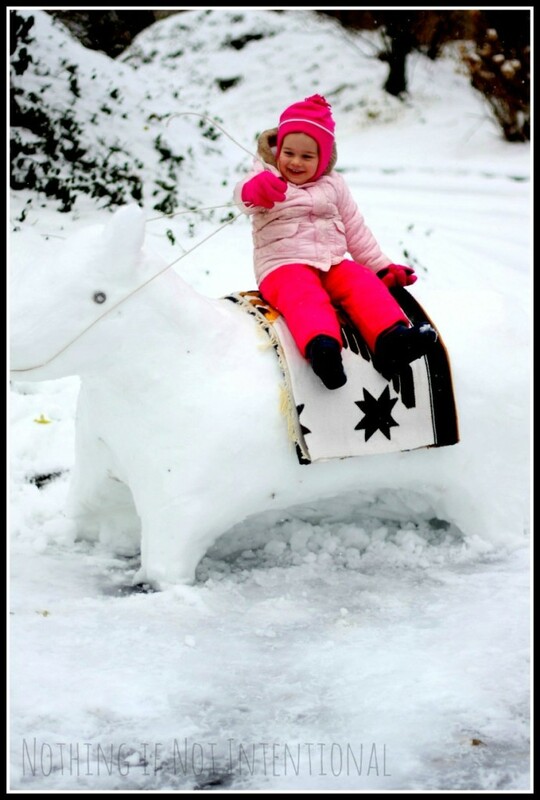 Naturally, when a snow started falling in December, I asked my dad (now better known as “Papaw”) if he could pretty please make a snow horse for my girls. Of course Papaw was happy to make a horse for his little grandbabies. My dad built this horse on his blacktop driveway and only needed two or three inches of accumulation. If you build it in your grass or yard, you’ll probably need four or five inches. Wet, easy-to-pack snow works best. To start with, pack snow as if you’re going to build a two-tier snowman. But instead of putting him upright, build him on his side. Dad used a big shovel to pack the snow together rather than rolling it into balls. Once you have horse base, add more snow to form the neck, head, and ears. Just like when you’re making a snowman, you need facial features. Coal could work for the eyes. My dad used extra-large hardware nuts. Washers would have worked too. We added a rope for the reins. And a blanket to make it warmer for the girls. Wanna know a secret? Our winter play day series involves three posts, but I’m not sure what I’m going to do on Thursday. 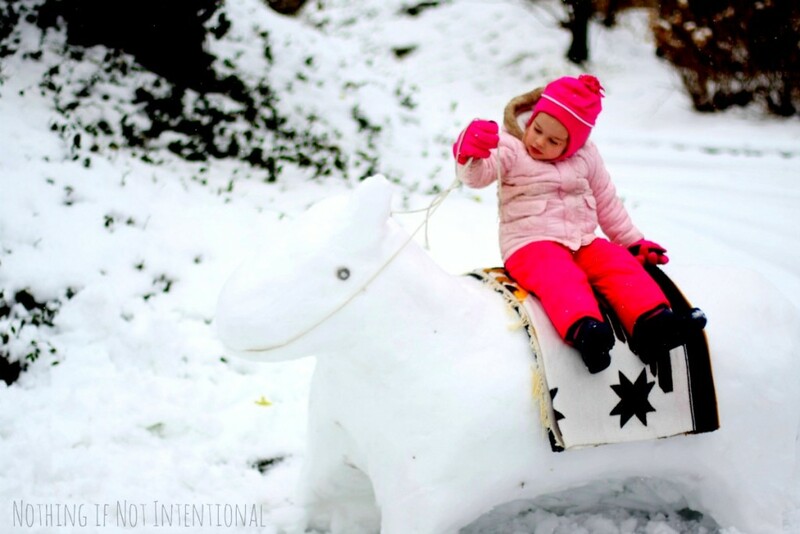 I got so excited about the snow horse idea that I forgot I needed to keep brainstorming! Check back Thursday to see what (if anything!) I came up with to share. The best way to make sure you don’t miss a post is to subscribe to email updates. I have a lot of fun on pinterest too, if you prefer to pin with me there! 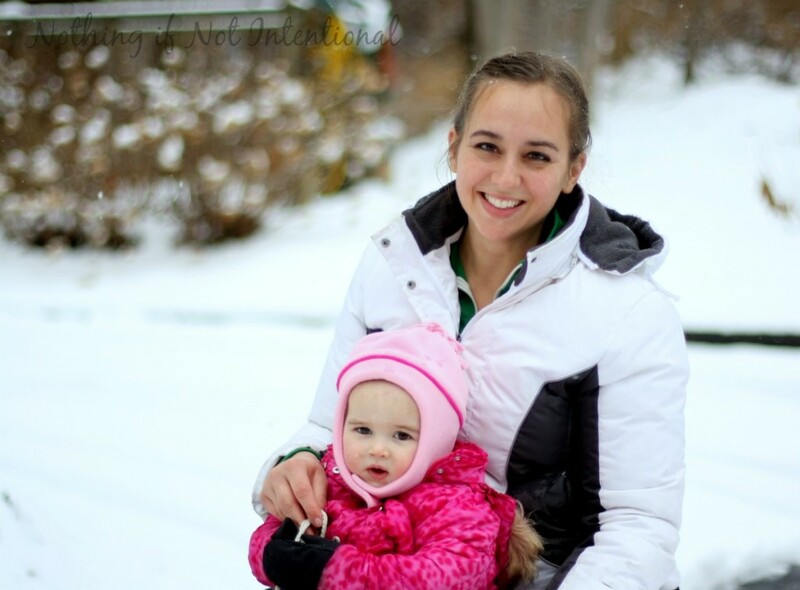 Pretend Snow Sensory Play with Trains from Play Trains! If you're new here, you may want to sign up for email updates so you never miss a new post. Thanks for visiting! ← Snowed in? Make Snow Cream! Pingback: Winter Fine Motor Play with Styrofoam "Snowballs" - Fun-A-Day! 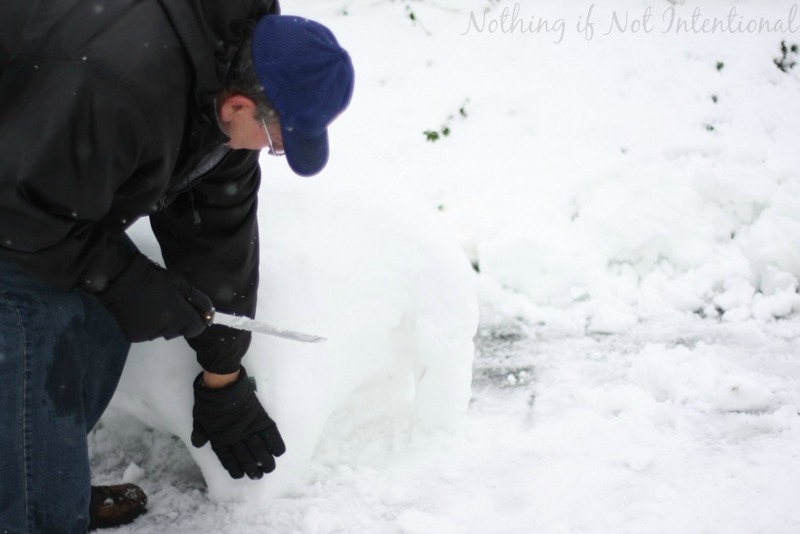 Pingback: Make the most of the cold with these simple and fun ice experiments! Thanks for visiting! We'd love for you to stick around! 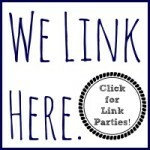 Enter your email address to receive free notifications of new posts by email. 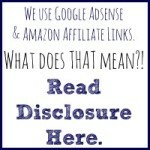 Shop with our Amazon link!